GreenSeat helps travellers and travel agencies to make their travel greener so we can keep on enjoying our beautiful world in the future. You offset the CO2 emissions of your trip and give households in developing countries access to sustainable energy. A win for the climate and a win for the local people. A Business Class seats takes up more room, which means that fewer passengers can fit in the same airplane. This makes the CO2 emissions per Business Class passenger higher than those from one in Economy Class. It is comparable to a car that emits the same whether there is 1 passenger or 4. The more passengers, the lower the emissions per person! You take your glass, paper and maybe even plastic to the recycling bin, don’t you? With GreenSeat you can also tidy up your CO2 emissions and clean up your travel. When you travel, you choose the means of transport that fits you best. You may even choose the greenest option. But every form of transport still emits CO2. At this time, CO2 offsetting is the only way to neutralize the climate impact of your trip. CO2 offsetting via GreenSeat is fast, easy and cheap! You offset your CO2 emissions by investing in sustainable energy projects in developing countries, which improves the living conditions of the people there. GreenSeat only supports independently verified projects; we can assure you that your investment goes to the right place and makes a real contribution to reducing climate change. GreenSeat is a reliable and trustworthy programme and is part of the Climate Neutral Group. GreenSeat calculates, for example, how long a windmill in India needs to generate electricity for in order to neutralize the emissions from your trip. The operation of the windmill means that the amount of CO2 in the atmosphere does not rise any further and you fight climate change. That’s what we call a CO2mplete trip! This short film (in Dutch) shows you how CO2 offsetting works. Cooking over an open wood fire is the number four cause of death in the world. This project is in line with a global campaign to reduce cooking over an open fire. Thanks to your ‘GreenSeat’, people can buy an affordable stove. This project also supports entrepreneurs in developing and marketing their product. Using an efficient stove reduces the amount of smoke produced, which is now equivalent to smoking 40 cigarettes a day. It also reduces deforestation and saves each family with a wood stove $110 per year. That’s a nice side effect of travelling greener! You can see how it works in this movie. Every day, millions of people in India breathe polluted air. Major causes of this pollution are power generation in coal-fired power plants and cooking over wood fires. By investing in wind energy projects in southern India, GreenSeat provides clean energy and releases less CO2 into the air. Thanks to these projects, local people have access to clean energy and jobs. More than half of the rural population of Africa does not have access to gas and electricity. Through this project, more than 10,000 farming families are able to use biogas generated from the waste produced by their own cows and pigs. Over the 10-year lifespan of a bio-digester, each family saves $1,400 and 2,600 hours that they don’t have to spend gathering wood. Cooking with biogas is also much healthier because it doesn’t release any harmful smoke. See how it works in this film. Choose the means of transport that emits the least in getting to your destination. For example, a bus to Spain from the Netherlands emits 6 times less than a plane. The remaining emissions can be offset with GreenSeat. The further you travel, the more CO2 you emit, so the cost depends on the zone you are flying to. You can green a return trip within Europe for €4.50 (zone 1), and a trip to Canada or a trip to the US for €11.50 (zone 2). Costs of a rental car: The amount of CO2 emitted per day by your rental car (150 km) is the same as the CO2 saved by running a windmill in India for 5 minutes. Running that windmill for 5 minutes costs €0.27 (excluding VAT). That’s no money at all for a clean car! And you can green a camper for €10 per 1000 km. All of GreenSeat’s projects are externally verified and meet the most stringent requirements. Verification of the projects is done by independent, internationally recognised agencies that are designated and checked by the UN. These agencies verify whether a project has been set up according to the criteria and whether it continues to meet them. GreenSeat is verified by multiple organizations – including by PwC and ICROA – and only works with certified projects. GreenSeat can therefore guarantee that the offsetting really takes place. Yes. GreenSeat neutralizes your emissions with projects that are certified according to the Gold Standard developed by the WWF and/or the Verified Carbon Standard (VCS). It is guaranteed that these projects reduce CO2 emissions and really contribute to better living conditions for local people in the areas of health, employment and income. A win for the environment and a win for the local people. A flight within Europe emits 0.2 kg of CO2. When you make an intercontinental trip, your emissions drop to 0.147 kg. Taking off and landing use a relatively large amount of fuel. GreenSeat gets its data from the Dutch National List of CO2 emission factors. This list is supported by the Ministry of the Environment and Infrastructure, and of course by GreenSeat. A plane burns a lot of fuel taking off. When it is in the air it uses much less. Therefore, short flights or indirect flights with stopovers are extra polluting per km. That means that for long flights, the average emissions are less per km. CO2 covers the Earth like a blanket. Thus, lowering the CO2 emitted in developing countries means less CO2 in the Netherlands. The same money can also do a lot more in those countries. We can give more people access to clean energy and offset more CO2 emissions than we could do in Europe for the same amount of money. Many people travel all over the world and so it makes sense to support projects outside Europe. Click here to see our projects. GreenSeat is verified by multiple organizations – including by PwC and ICROA – and works only with certified projects. GreenSeat can therefore guarantee that the emissions are offset. Certified means that the climate impact of a project is estimated ahead of time by an independent body such as TUV – the German national research institute. The project is reviewed annually to see ensure that its impact on climate change is actually being achieved. In this certified system, climate credits are issued per tonne of CO2 that is actually reduced. These credits are placed in a register and removed when they are sold. In this way, it is ensured that the credits can only be sold once. Burning fossil fuels, such as petrol, releases the greenhouse gas CO2. If you travel CO2 neutral, the CO2 emissions from your transport do not have an impact on climate change. In addition to CO2, aircraft also have other emissions, such as soot, vapour trails and nitrogen oxide. If you were to offset these gases as well, you would travel climate neutral. 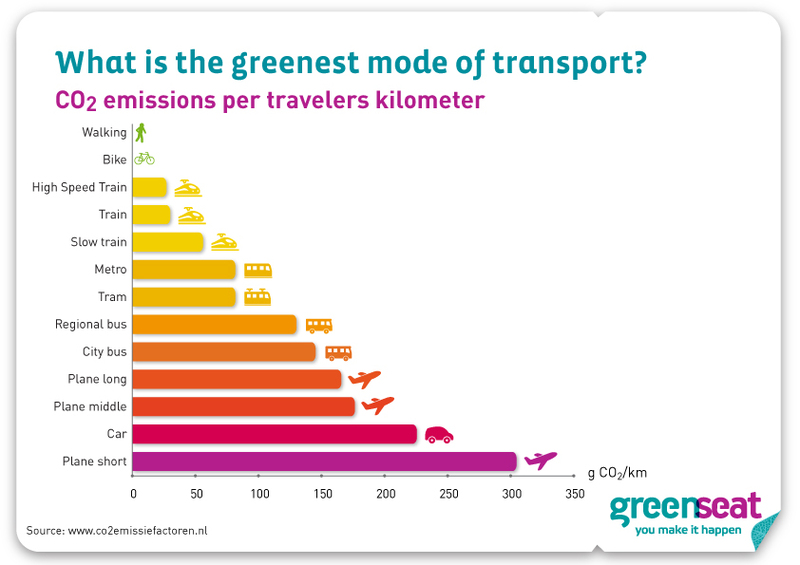 With GreenSeat, you travel CO2 neutral because CO2 makes up the largest share of the pollution. By only offsetting the CO2, the cost of your contribution is clearer and more attractive. Research done by travel agencies shows that many more people are prepared to offset their CO2 if the contribution is affordable. The more people who travel greener, the less the impact on the climate. No, that is not the case. The EU ETS system puts a tax on some of the CO2 emissions of flights within Europe. The tax money is not used to offset. Your flight continues to emit CO2 and other greenhouse gases. So if you want to neutralize your emissions, it can be done by offsetting these through GreenSeat climate projects. Of course, we would like to answer all of your questions. Please send us a mail via info@greenseat.com.